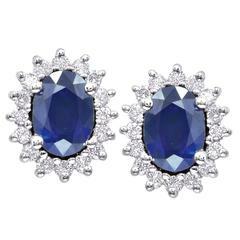 These lovely earrings feature an oval cut vivid blue sapphire (total weight 1.67 carats), surrounded by a a halo of round white diamonds (total weight 0.78 carats). Many of our items have matching companion pieces. Please view our other listings or inquire about your wishlist item. An insurance appraisal certificate (COA) will be included. The certificate image posted in this listing is only for illustration.